On the 6th (Mon), explore the striking landscape of Gros Morne National Park. On the 7th (Tue), you'll have a packed day of sightseeing: hike along Lookout Trail, then visit a coastal fixture at Lobster Cove Head Lighthouse, and then trek along Gros Morne. To see traveler tips, other places to visit, and more tourist information, go to the Gros Morne National Park road trip planning app . Quetta, Pakistan to Gros Morne National Park is an approximately 34-hour flight. You'll gain 8 hours traveling from Quetta to Gros Morne National Park due to the time zone difference. Traveling from Quetta in May, expect Gros Morne National Park to be cooler, temps between 13°C and 1°C. Finish your sightseeing early on the 7th (Tue) to allow enough time to travel to Quebec City. On the 8th (Wed), admire the sheer force of Parc de la Chute-Montmorency and then get to know the fascinating history of Old Quebec. For maps, other places to visit, more things to do, and more tourist information, you can read our Quebec City journey planner . You can fly from Gros Morne National Park to Quebec City in 9.5 hours. Another option is to do a combination of bus, ferry, and car. The time zone difference moving from Newfoundland Standard Time (NST) to Eastern Standard Time (EST) is minus 1 hour. Expect a bit warmer temperatures when traveling from Gros Morne National Park in May; daily highs in Quebec City reach 19°C and lows reach 9°C. Cap off your sightseeing on the 8th (Wed) early enough to travel to Niagara Falls. Start off your visit on the 9th (Thu): identify plant and animal life at Niagara Parks Butterfly Conservatory, then explore the striking landscape at Journey Behind the Falls, and then admire the sheer force of Niagara Falls. For photos, traveler tips, reviews, and tourist information, refer to the Niagara Falls tour planner. You can do a combination of flight and train from Quebec City to Niagara Falls in 7 hours. Alternatively, you can drive; or take a train. When traveling from Quebec City in May, plan for a bit warmer days in Niagara Falls, with highs around 24°C, while nights are about the same with lows around 11°C. Finish up your sightseeing early on the 9th (Thu) so you can travel to Vancouver. Start off your visit on the 10th (Fri): step off the mainland to explore Granville Island, take a stroll through Gastown, and then take in the dramatic natural features at Vancouver Seawall. Here are some ideas for day two: tour the pleasant surroundings at Stanley Park and then kick back and relax at Kitsilano Beach. For reviews, traveler tips, other places to visit, and tourist information, go to the Vancouver road trip planner. Do a combination of train and flight from Niagara Falls to Vancouver in 9.5 hours. Alternatively, you can do a combination of bus and flight; or drive. The time zone difference when traveling from Niagara Falls to Vancouver is minus 3 hours. When traveling from Niagara Falls in May, plan for a bit cooler days and about the same nights in Vancouver: temperatures range from 21°C by day to 12°C at night. Wrap up your sightseeing on the 11th (Sat) to allow time to fly to Whistler. Kick off your visit on the 12th (Sun): ski along the peaceful trails at Whistler Blackcomb. For ratings, traveler tips, maps, and more tourist information, you can read our Whistler journey maker tool . Fly from Vancouver to Whistler in an hour. Alternatively, you can drive; or take a shuttle. Traveling from Vancouver in May, Whistler is little chillier at night with lows of 5°C. Wrap up your sightseeing on the 12th (Sun) early enough to drive to Jasper National Park. 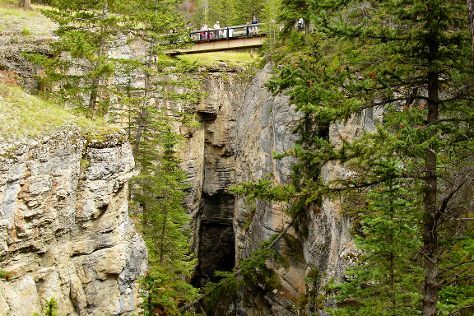 Step out of the city life by going to Maligne Canyon and Angel Glacier. There's lots more to do: trek along Skyline Trail, choose your vessel at Pure Outdoors, explore the activities along Moab Lake, and head outdoors with Lac Beauvert. For reviews, ratings, more things to do, and more tourist information, read our Jasper National Park driving holiday site . Getting from Whistler to Jasper National Park by car takes about 10.5 hours. Other options: do a combination of bus, flight, and shuttle; or take a bus. The time zone changes from Pacific Standard Time to Mountain Standard Time, which is usually a 1 hour difference. Traveling from Whistler in May, you can expect nighttime temperatures to be little chillier in Jasper National Park, with lows of 0°C. Wrap up your sightseeing on the 15th (Wed) early enough to take a shuttle to Banff National Park. 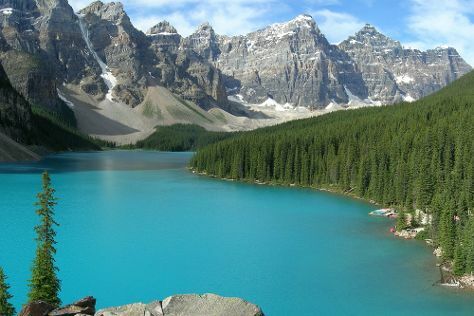 Kick off your visit on the 16th (Thu): get to know the fascinating history of Fairmont Chateau Lake Louise, then look for all kinds of wild species at Valley of the Ten Peaks, and then contemplate the waterfront views at Moraine Lake. Here are some ideas for day two: hit the slopes at Sunshine Village. For where to stay, ratings, reviews, and tourist information, go to the Banff National Park trip planner . You can take a shuttle from Jasper National Park to Banff National Park in 3 hours. Another option is to drive. Traveling from Jasper National Park in May, you will find days in Banff National Park are a bit cooler (15°C), and nights are about the same (-1°C). Finish your sightseeing early on the 17th (Fri) to allow enough time to travel back home.